In the culinary arts, an emulsion is a mixture of two liquids that would ordinarily not mix together, like oil and vinegar. There are three kinds of emulsions: temporary, semi-permanent, and permanent. An example of a temporary emulsion is a simple vinaigrette while mayonnaise is a permanent emulsion. An emulsion can be hot or cold and take on any flavor from sweet to savory; it can be smooth or have a bit of texture. No matter the type of emulsion, these dressings and sauces enhance the taste of the dish, bringing another level of flavor to foods such as salads and eggs. But what is truly interesting about emulsions is how the liquids blend together and make a thick consistency. When you look at oil and vinegar separately, you wouldn't necessarily imagine they could become unified into a viscous liquid. But certain substances act as emulsifiers, which means they help the two liquids come together and stay together (either temporarily or permanently) when the mixture is agitated. In the case of mayonnaise and hollandaise, it's the lecithin in the egg yolks that acts as the emulsifier. Lecithin, a fatty substance that is soluble in both fat and water, will readily combine with both the egg yolk and the oil or butter, essentially holding the two liquids together permanently. In a stable emulsion, the droplets of one of the liquids become evenly dispersed within the other liquid. The resulting liquid is thicker than the two original liquids were. In the case of salad dressing, oil droplets are suspended within the vinegar. As this vinaigrette sits, however, the oil and vinegar will separate again, making this a temporary emulsion. A fine powder can help to stabilize an emulsion, and so can a starch. That's why a roux is useful in thickening sauces; it's the starch in the flour that joins the butter to the liquid stock. A cornstarch slurry works the same way, as does the technique known as monter au beurre, which is essentially a variation on liaison finale that involves stirring raw butter into a sauce right before serving it; the fat droplets form an emulsion with the liquid in the sauce. A temporary emulsion is one that will separate in under an hour. It will emulsify again with some sort of agitation such as shaking or whisking. A salad dressing is a temporary emulsion—the oil and vinegar are poured into a jar and agitated until they come together as a unified liquid. The consistency will change, becoming thicker, and the color will be a melding of the two ingredients. 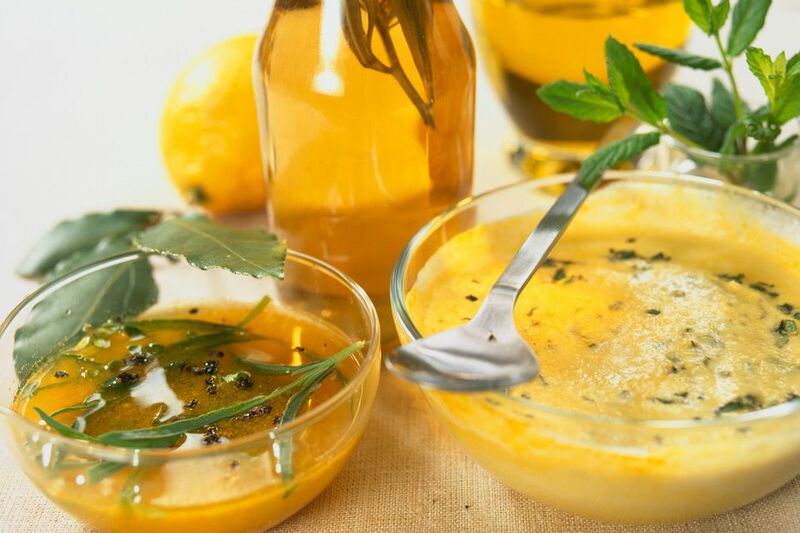 Once the vinaigrette sits for a while, however, the oil and vinegar will start to separate. A simple shake or whisk will emulsify again. If the emulsion is maintained for a few hours before separating, it is considered semi-permanent. Hollandaise sauce is a semi-permanent emulsion; it is made of egg yolks and clarified butter. Clarified butter, which is pure fat, is best for forming the emulsion versus whole butter; whole butter contains around 15 percent water, and this water can destabilize the emulsion. A hollandaise sauce will be stable longer than a vinaigrette, but it is recommended that you serve the sauce immediately. A permanent emulsion is one that will remain unified in its thickened state for an extended period of time. Mayonnaise is an example of a permanent emulsion, consisting of egg yolks and oil. Egg yolks and oil would not naturally come together, but by slowly whisking the oil into the egg yolks, the two liquids form a stable emulsion that won't separate. If the oil is added too quickly, or if the mixture is not agitated properly, the egg and oil will not come together and will fail to emulsify. One less obvious example of a food that is an emulsion is chocolate, which is an emulsion of milk and cocoa butter. In fact, milk itself is an emulsion of water, protein solids, and butterfat. If you've ever added lemon juice to milk, or maybe boiled it, you've seen what curdled milk looks like. Curdling is the breaking of the emulsion, which causes the protein solids to coagulate and separate from the liquid. Another surprising example of an emulsion is certain types of sausages and forcemeats. Hot dogs are an emulsified sausage where meat, fat, and water are combined to form a smooth filling which is then stuffed into a casing.